In their very roots, Japanese Monsters are more than meets the eye. Over and again, Godzilla is oft times referred to as a "force of nature" by westerners. Wind, Rain, Thunder, Earthquakes, Tsunamis are forces of nature. This divine monster is more than that. Much more. Godzilla, by the declaration of his creators, is "War Incarnate," said director Ishiro Honda in reference to the 1954 original — his hide covered in the keloid scars of nuclear bomb victims while his breath is the forbidden fire of Megiddo. No, he is not merely some simple force of nature. Godzilla is not just a reanimated prehistoric creature. Steeped in Shinto mythology, he is a kaiju — the eternal, undying supernatural vessel of mankind's judgment — our karmic retribution for having split the atom. 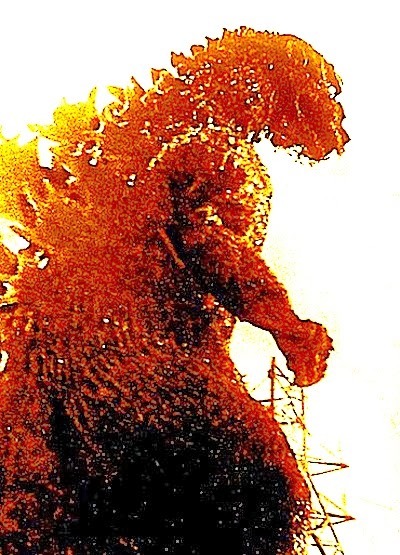 "Though it's routine to see Godzilla as a symbol of nuclear power gone awry, it struck me that Japanese culture might have spawned something like Godzilla had the Manhattan Project failed to produce its deadly fruit. At the conclusion of Godzilla's final and most devastating assault on Tokyo, he's finally driven away by fighter-jets-- in my opinion, not because their strafing-fire hurts him any more than the electricity and tank-shells he's shrugged off, but because the aerial bombardment confuses him, causing him to seek cover in the ocean. At this point, some of the survivors ashore cheer at the temporary victory of "their boys," and as I watched that scene it struck me that Godzilla is also the demon of the Japanese defeat, incarnate in the form of an ancestral dragon/dinosaur. Many before me have proposed this alternate WWII-scenario: had the U.S. not developed workable atomic bombs, and had Japan continued to refuse to surrender, the U.S. and their allies would have invaded with aerial and naval forces, perhaps wreaking on Japan a more general devastation than the targeted destruction of two Japanese cities. I don't repeat this scenario with an eye to making any apologia for the Nuclear Age. But as I watched Godzilla being driven away by the jets, I thought, "In a realistic war-film, that might have been jets driving away an attacking destroyer or the like." And of course, in this alternate-world scenario, that victory would have been equally temporary; Japan would eventually have been forced to surrender, but only after incalculable carnage, albeit carnage brought about through more conventional military means." Thanks for posting your interesting interpretation; many of us have our own person thoughts and ideas for the character and his symbology. And there are some insights that are valid or worthy of discussion. Meanwhile, I seem to be more fascinated about what the actual filmmakers sought to create and their personal insights into the creation of Godzilla. Even Gamera director Noriaki Yuasa's comments in the 1998 BBC Godzilla documentary are fascinating.